Pie is status quo dessert for Thanksgiving and Christmas meals. Be it pumpkin, pecan, apple, cherry or a meringue, guests will always save room for a slice. 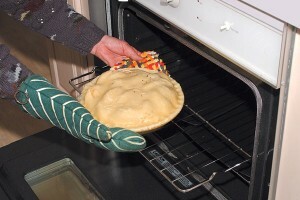 Before you put your pie crust in the oven, wet the edges with a little bit of water. This will make the crust crispy and flaky. Too much water may make the crust soggy, though. 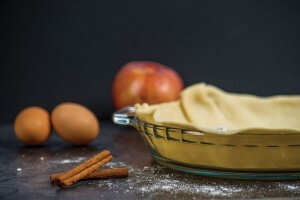 Other bakers will strain the juices out of fruit fillings before spreading them into the pie shell. You can boil the juice into a syrup and then add it back into the fruit mixture. Have you ever taken a pie shell out of the oven, only to find that the crust bubbled up on the bottom? Whenever you’re baking a pie crust without the filling, use pie weights. Pie weights keep the dough from rising up from the pan. You can purchase ceramic or metal pie weights from supercenters, online and in baking specialty stores. If you don’t have pie weights or don’t want to make the investment, you can use dried beans or rice. Place the beans on a piece of cheesecloth and tie up the cheesecloth to create a little bag. Making your own meringue doesn’t have to be a headache. Sometimes it shrinks and sometimes it just doesn’t hold up. Wait to beat the egg whites until they are at room temperature. Utah State University Extension recommends adding a teaspoon of cornstarch to the sugar before beating into the egg white. Also, gradually add in the sugar instead of dumping it in all at once. Pay attention to the consistency of the meringue as your beating it with a hand mixture. The meringue should form soft peaks when it’s the correct consistency. When you spread meringue over the pie filling, make sure it touches the edges of the pie crust. This should keep it from shrinking. Some home pie makers have experienced a pumpkin pie that is cracked once it’s taken out of the oven. The filling cracks because it’s been baked too long. Keep a close eye on your pumpkin pies as they bake. And remember the old rule: your pie is completely cooked when a knife inserted into the center comes out clean. If you’re baking more than one pie in the same oven, lower the baking temperature. Place each pie on a separate baking sheet. 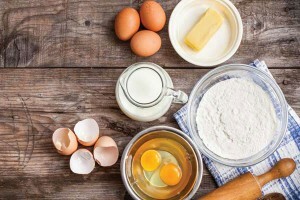 For every cup of flour, only use two or three tablespoons of liquid (water, milk, egg, etc.). The liquid should be ice cold. Once you’ve made the dough, refrigerate it for a couple of hours. Before you roll the dough, let it stand for a few minutes. Roll the dough to a thickness of ⅛ inch. Remember that rerolling dough or stretching it too much may make it shrink during baking. Need a pie crust recipe? Try this no-fail version from the Farm and Dairy kitchen. Have any other pie baking tips? Share them with us in the comments below.